Confess. Cleanse my soul. Bare it for all. Why? Who will love me if they know? Farewell to Gabriel Garcia Marquez. 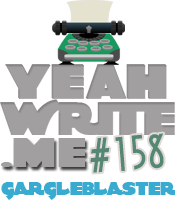 The Yeah Write Gargleblaster honours him this week with the Ultimate Question: “Tell me something, old friend: Why are you fighting?”. For more 42 word responses, click the badge below. ← A better plan: anybody? anybody? Excellent! That’s one way of telling if a person is “the one”! I really enjoyed the rhythm you built up with the line breaks and punctuation. well done. Haha! Nice job twisting the response around back on the prompt. *hahaha* I love this! You totally just thumbed your nose at him, and I loved it. I haven’t read much of his work, but I gather he’d like your irreverent attitude. 🙂 Thanks for linking up – and being honest! This is not my favorite work by him; I don’t think I ever finished it, even as he’s my inspiration for writing along with John Steinbeck. I have always said Anthony Hopkins’s film version of Remains of the Day nailed the title because that was all you had left of it once it was over. Fun take on the prompt! I think good books have many dimensions, just like people, so it’s better when people have radically different opinions of them! I can’t imagine anything interesting that would be liked by everyone.